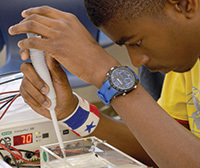 This 2-week summer research experience is designed to support the next generation of minority scientists and health professionals. Selected students will build lab and computer skills required to embark on a STEM-driven career. Note: camp has a separate application process. REGISTER for a parent/guardian account. If you already have an account, LOGIN. Complete camp applications for all family members under that account. We look forward to seeing your campers this summer! Looking for a 2019 residential camp? As a licensee of the CSHL DNALC, the Notre Dame DNA Learning Center offers week-long overnight science camps on the university campus in Indiana. Registration is open! DNA Learning Center educators will be teaching two camps at The Portledge School in Locust Valley, NY as part of the Summer Adventures Program. Visit the Summer Adventures site for more information.